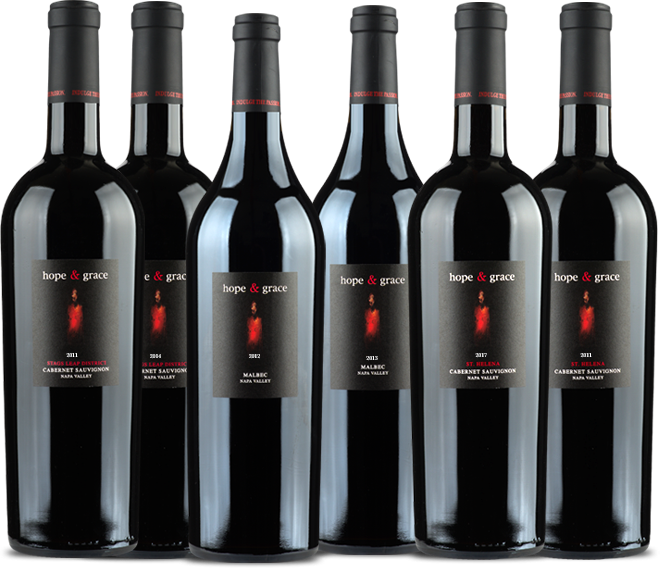 ADD ANY ADDITIONAL hope & grace wines to your shipment and enjoy a 15% discount and complimentary shipping on your entire order. Winemaker Notes: Deep purple color coats the glass ... Intoxicating aromas of rich, dark berry fruit, exotic spices, with a hint of coca dust... Ripe blackberry and cherry fruit submerge the palate with a rich, lush lingering finish. We encourage cellaring of this gorgeous Cabernet, with a little patience comes great reward. Winemaker Notes: This cabernet has intense aromas of black cherry fruit, cola, tobacco leaf, and tea, finishing with a hint of café ole. Smooth flavors of Bing cherry & anise glide across the palate ... leaving a rich, lingering mouth feel.